Are you a subscriber? If so, your kit is on it's way if you don't already have it! 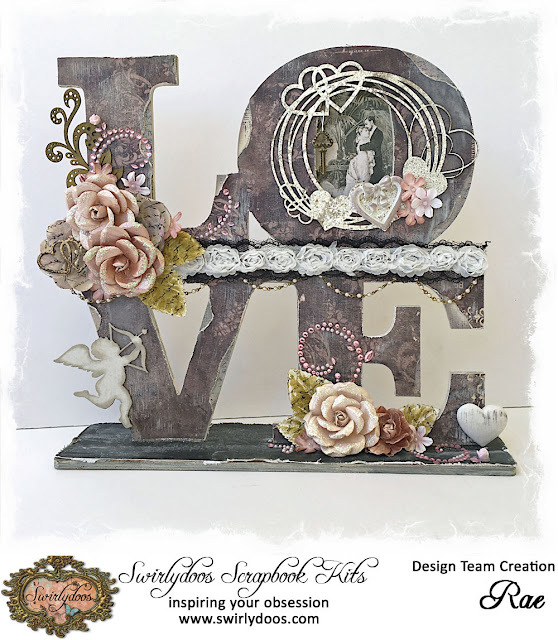 If not, check out the Swirlydoos store to see if there are any February kits or add ons in the store! So, I just ADORE the papers in the kit this month. They are so elegant and the colors are amazing! I started this layout by cutting up my layers, placing them where I wanted them and made some pencil marks so I knew exactly where to put my stamping and stenciling. I used Prima grey and purple sprays for splats. I added some chipboard pieces from my stash for the oval part of the sketch; I used the Minx from Art Anthology on the top chipboard layer to get that rich gold color! I painted the metal butterflies that came in the embellishment add on with some paint and black gesso, an did the same thing for the title. 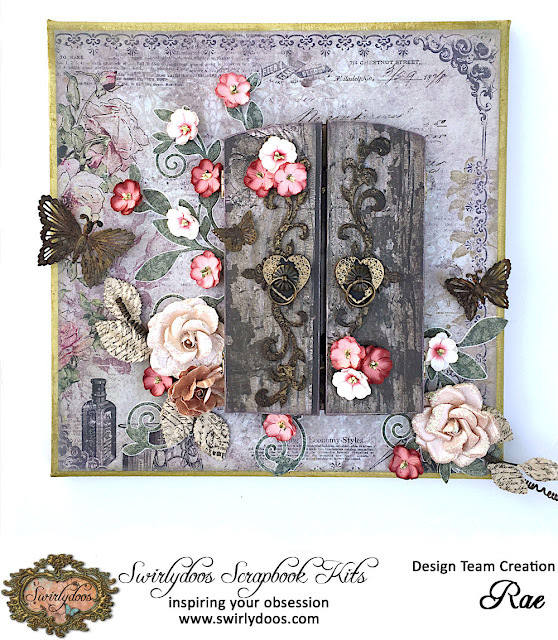 I added some clocks from the ephemera pack in the main kit, and the beautiful pink lace, from the embellishment add on. I finished it up by adding some flowers from the main and flower add ons, and some green bling. I don't get many good pictures of my Owen, but I snapped this one on his 13th birthday, and I really wanted to scrap it. Not an easy task with this elegant kit, but I enjoyed the challenge to create a masculine layout with it! I made a bunch of banners and ripped some large layers for the background. I did a lot of distressing, added some stenciling using the stencil from the mediums add on. I whitewashed the background with white gesso and highlighted the banners with black ink and brushed over it with water. The music notes are from the embellishment add on, as well as the metal heart. I placed that metal heart in a bottle cap I filled with graphite texture paste, glued on the numbers, painted with black gesso, then painted over with some metallic paints, and placed it in the corner of the picture with some flowers from my stash and the flower add on. So, we got this cute wood frame in the main kit, and I wanted to add it to a canvas. This is a cheap 12x12 canvas from Michaels. I painted the sides and edges with the green paint from the mediums add on, then cut one of the papers to size. I adhered it using soft matte gel on the back and front of the paper. I added vines I cut from the green paper in the kit. It didn't show up as well as I wanted, so I outlined the vines with a white pen, then added flowers from the flower add on. I also added flowers from the main kit and used a vine from my stash under those ones. I covered the frame with paper. 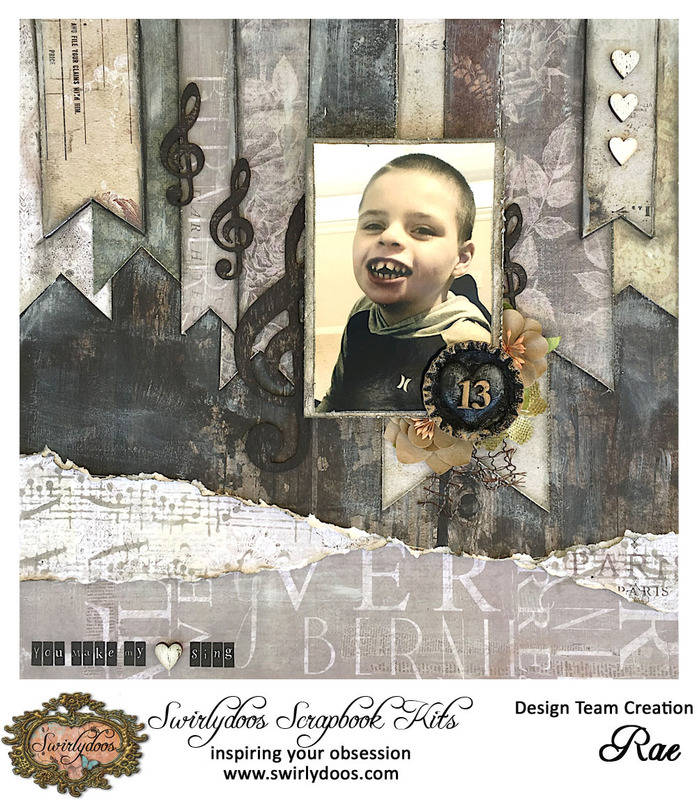 The flourishes on the front are Blue Fern Studios chipboard pieces that treated with paint from the mediums add on, crackle paste and black ink. On the inside of the frame, I added more vines, with daisies from the flower add on. I decided o not to put the glass from the frame on, and added a picture and some embellishments for more of a shadow box effect. Thanks for taking the time to look at my projects today, and every month for more than four years! It's a bittersweet day for me as this will be my last design team post for Swirlydoos. I'm taking some time to explore some career opportunities. So, thank you for all of your comments and support! The party continues over at the Blue Fern Studios blog. Have fun! I just saw your projects on FB and fell in love with them all! Great job! Oh my gosh Rae... I'm going merrily through all your projects... ooohhh and ahhing at one after the other and then I get to your last paragraph. No.. say it's not so! I can't imagine a Swirlydoos Blog Hop without you! :( You are so talented... I hope your new job will allow time for you to continue scrapping! Best of luck as you look around and explore possibilities. Gorgeous projects! Sad to see you leave Swirlydoos! Thanks for featuring the Timeless collection ins such a beautiful way! oh my word Rae! You cant leave us!! I love seeing your work every month, it will not be the same at Swirlydoos without you :( Wish you all the luck in the world and best wishes for what ever turns up next for you! Thank you for your inspirational work and fab tutorials. Rae, your creations are gorgeous, as always! I love your OTP project and the masculine LO is perfect for showing how versatile these papers can be! I have learned so much from your tutorials and will miss you on the DT so much!!! Best wishes for whatever is coming next for you! Oh my gosh! These are fabulous projects. I love how the papers can be used for either feminine or masculine pages. Your LOVE project is wonderful and I LOVE that you included a photo in it. Last but not least the doors frame is awesome. You are a wonderfully talented designer! Well done. Your projects are All beautiful! The frame and Love projects are really inspiring and since I'm looking for OTP ideas, I really appreciate your ideas. Thanks! Beautiful page from the sketch, and I love your frame and how you added to a canvas!!! Thanks for the off the page tutorial video!!! I absolutely love you framed canvas it's awesome! 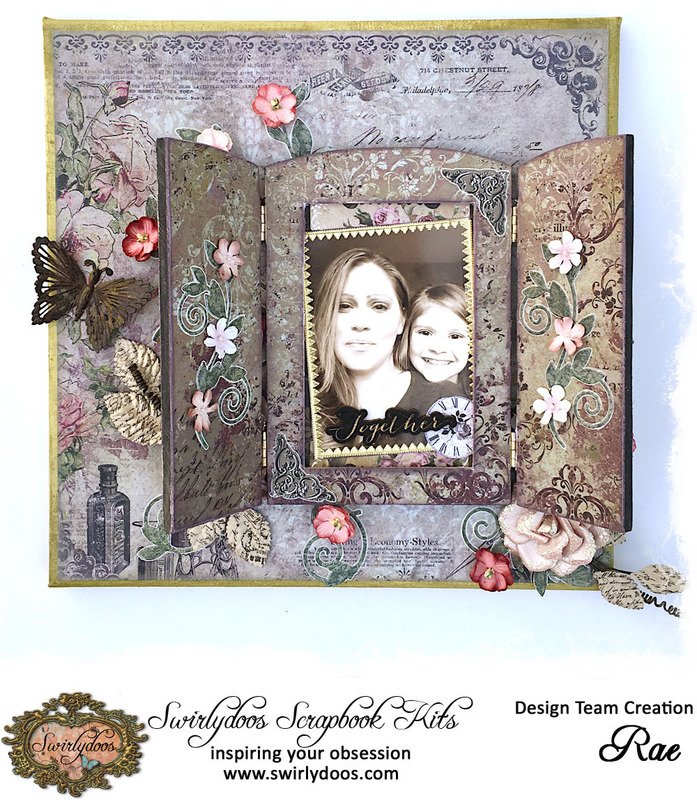 The beuatiful vines and added embellishments look great and your layouts are lovely. You do such beautiful work. Best of luck to you in your future endeavours! Wonderful creations! Having fun perusing each blog!! Thanks for sharing this wonderful opportunity. I loved what you did with the frame on the canvas, and also loved your sketch layout. The Love project is fantastic. the frame on canvas is gorgeous! all your projects are! I love the set of photos on the first layout. a masculine feel to the page. the frame is a fun addition to a page. This kit is a wonderful starting point for your talents. You really have done a beautiful job with this kit. Love the masculine layout, the love project and the creative use of the frame. Your sketch was my fav LO of yours from this kit. The bits of MM around the pics and page were grungfully fabulous. However, your take on the LOVE sign was out of this world! I adore the color and can't wait to see the video. Love the canvas and frame. Wonderful work. Beautiful projects!! I love the sketch challenge layout!! Gorgeous! Great idea to use the frame on a canvas as a shadow box. The result is gorgeous. You've made this kit girly AND masculine, Rae, and I love the variety of uses that you've demonstrated. Your frame/canvas project is such a great idea, but my fave has to be the "O" page - love the banners and torn paper and notes. Your last comment is indeed bittersweet; promise that we'll see lots more of you!!! All your projects are beautiful Rae.